1.With your compass, measure the width of your clock. Take this measurement, draw your circle on to a sheet of First Edition Textured card stock and cut out. 2.Begin sticking your chosen Dovecraft Washi Tape strips across your circle. Vary your design by alternating your Dovecraft Washi Tape strips. 3.Once you have finished adding your Washi Tape, cut the excess around your circle. 4.Find the centre of your circle and with a craft knife, cut out a circle to fit the hands of your clock. Begin adhering the numbers from your Simply Creative Black Foam Alphabet Stickers pack around the outer edge of your circle. 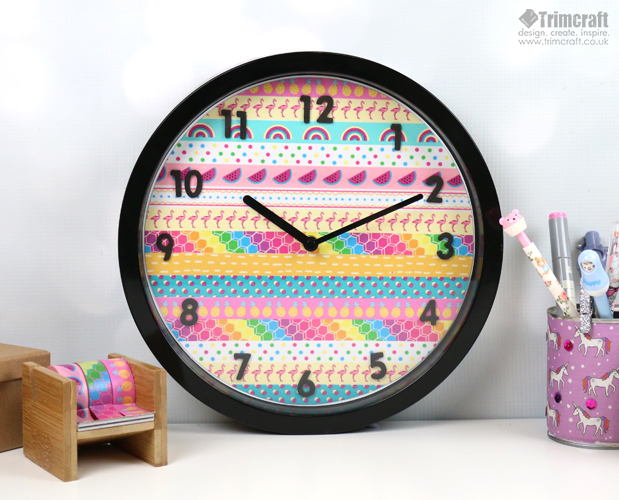 5.Unscrew the hands on your clock and stick your Washi Tape circle to the face of your clock with Dovecraft Perma Fix tape. Place your clock face back into the case. 6.Screw the hands back into your clock and now you have a personalised clock design! Alternatively you could choose a favourite First Edition paper design and use this as your background! We have kept the original numbers underneath our design so if you wanted the clock back to its’ original form, all you would need to do is peel off the washi tape design. How will you upcycle your clock? We'd love to see your inspired makes so remember to upload them to the project gallery and to #trimcraft when uploading to social media.